Students will be able to identify the main idea and supporting details of a short informational text. Lead a brief discussion with students on why it is important to read and comprehend informational text. Tell students that it is not only important to read informational text from textbooks, but also from their peers. 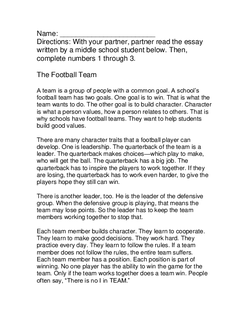 Explain to the students they will be reading and analyzing an essay about football written by a intermediate student. Show students a teacher model of the Bubble Story Organizer with the Main ideaAnd Supporting detailsOf a text, previously shared whole-class. 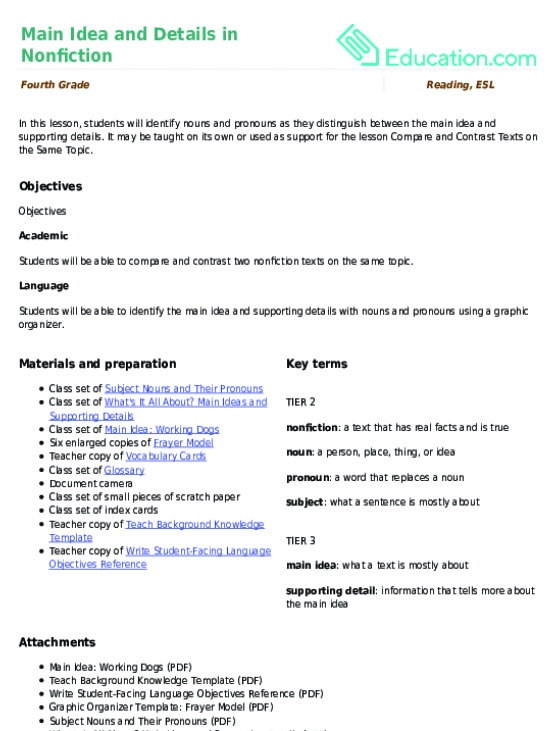 Point out how the noted DetailsSupport the Main ideaAnd clarify any questions students may have. Arrange students into pairs and explain that they will be partner reading the essay. Suggest that a good way to partner read is to take turns reading paragraphs. Hand out The Football Game worksheet to each student. Hand out a highlighter to each student. Tell students that they will be reading to find the Main ideaAnd Supporting details. Tell students that when they are done reading, they need to raise their hands, then go on to complete numbers 1 and 2. While the students are partner reading and completing numbers 1 and 2, walk around the room to make sure students are staying on task. Help when needed. As students start to raise their hands, scan their work to make sure they underlined the main idea and highlighted at least five supporting details. If students are ready to go on to number 3, have them return to their own seats and give them each a copy of the Bubble Story Organizer. Have students complete the Bubble Story Organizer (number 3) independently. Enrichment:Challenge above level students to research an interesting subject and work on an essay outline for it between activities. SupportPair a student who needs support with a student who understands the lesson content. 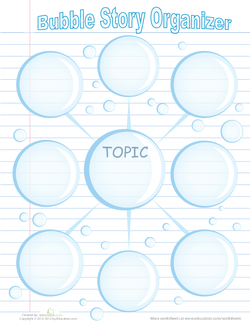 Use the Bubble Story Organizer as an informal assessment tool. Have the students share facts from the essay that they did not know before, or that they found interesting. Have the students share topics they might choose to write essays about. In this reading lesson, kids will examine the writing of a intermediate student and use it to learn more about main ideas and supporting details. As your students complete this reading comprehension exercise, they will learn about Native American Foods and practise finding the main idea. 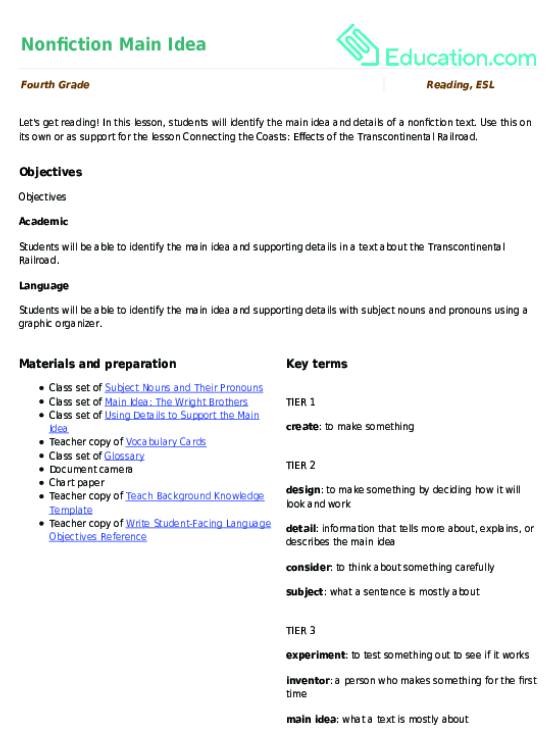 Get to the point with this worksheet about the main idea and how supporting details help it make sense. 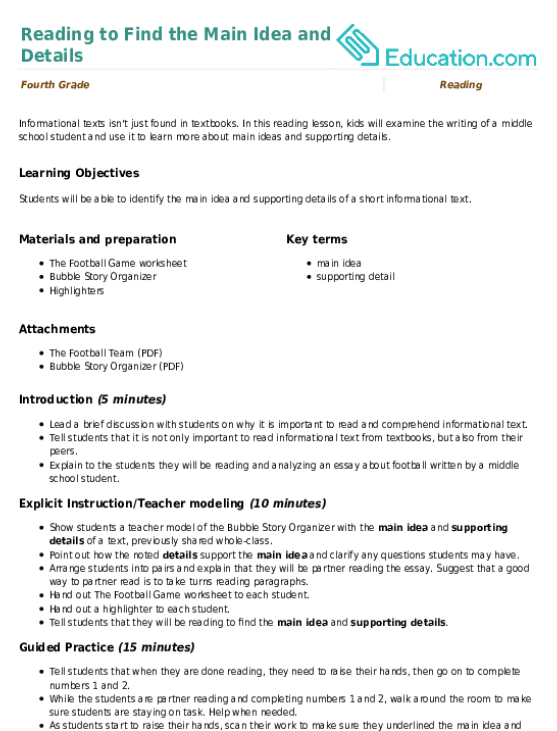 In this lesson, students will identify the main idea and details of a nonfiction text. As your students complete this reading comprehension exercise, they will learn about their lungs while practising active reading skills.